Spring retracted with 30 AMP rating collector ring. 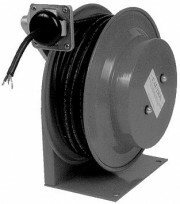 Supplied with inlet and outlet plugs at wire AMP rating. Rated 115 volt 60 Hz single phase only. (For Indoor use).